Lamae Bal is an ancient Nede and the first ever vampire. She can be found inside her crypt, where she welcomes the ones gifted with vampirism. Due to your nature as a vestige, she is the only one who can turn you into a vampire. Scion of the Blood Matron: Enter the crypt of Lamae Bal to become a vampire. The basin of suffering is to the right and north of Rahaja and the center pool. You drink some of the water and see a vision. 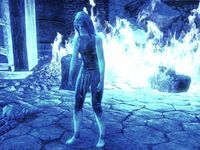 Lamae Bal: "When I was a priestess of Arkay, Molag Bal ravaged me and left me for dead. A group of nomads tried to purify me with fire. But I awoke… changed." Selenu: "The poor girl. May these flames purify her spirit." 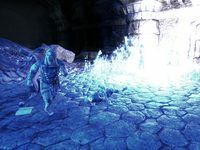 Vraseth: "Elder, what do you believe happened to her?" Selenu: "Her body was… mangled, rent [sic] apart by a terrible darkness. Its corruption is still on her. I can feel it." Vraseth: "Is it true her wounds healed on their own?" Selenu: "Yes. This is why I insisted we perform this rite at once." Selenu: "No. We're too late. Head to the southern pillar where blue flames burn on top of a symbol of Molag Bal's face. "Molag Bal, Father of Torment, we curse you. You sought to poison us with your blood. King of Corruption, your children are coming. They will defile and destroy you." In the other northern corner of the room is the basin of loss. "When I saw what I had done, I called out to my god, Arkay. I prayed that he would rid me of Molag Bal's curse. But Arkay did not answer." Drinking from it reveals another vision, where Lamae emerges from a fire surrounded by drained Nomads. "Arkay! Answer me! I am your priestess! Answer! Molag Bal said you would not come. He said you turned your light away from me. Arkay! Do you hear me? You are false! I reject you!" "Arkay the Forsaker, we curse you. You left us to suffer in darkness. But we survived. And in darkness we grew. Now, we feed upon your followers. We will use their stolen strength to conquer and consume you." "Initiate. Kneel in the black pool and submit yourself to me." "Children, this is your kin. Life still flows within its blood." "Tear it out. Drain it, so that it may join us." "Now, you are one of us." "I offer you a gift. The catacombs are filled with the Defiler's cultists. Fresh blood." "Sneak up behind your prey and feast. Relish your new powers. Embrace my blessing." "Drink deep from my gift." She send you to kill the cultists. Return to the pool, and speak to Lamae Bal when all are dead. "My beautiful abomination, how you shine in the dark. Now listen. I must warn you." Speak, and I will listen. "Relish this new life I have given you. Feed and grow powerful. Find others of our kind. Form families. Bring new children into the fold!" "Your kin live among the mortals. They may be wearing rags or crowns. They may hide within or rise above the masses. This page was last modified on 22 September 2018, at 23:27.